KEC International is the second largest transmission tower manufacturer in the world. It delivers such projects in 45 countries. Synergistic diversifications into Power Systems, Telecom, Water and Railways have de-risked the business. The SAE Towers acquisition (USA) in 2010 was also successful. 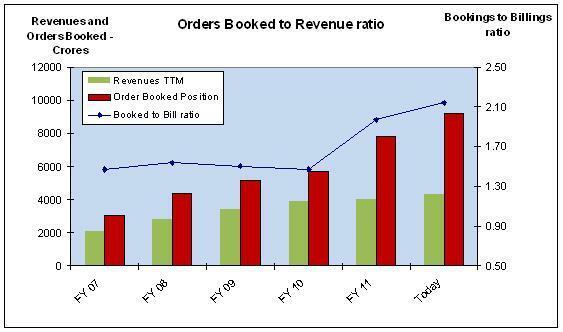 The Order Book is at 2.2 times FY11 sales. In the last 6 years, Price has barely increased by 1% while the EPS growth is 30% CAGR. The steep price fall of 2011 is done with, and the recovery has started. The KEC share is available at a 37% discount to valuations. Invest for long term in this ‘modern powerhouse’. KEC International is an Engineering Procurement and Construction (EPC) company focused on Power Transmission. It is the largest transmission tower manufacturing company in the world. It is the 3,900 crores (FY11) flagship company of the RPG group. Current Market Cap is 1609 crores. In addition to Power transmission, it has diversified into related areas like Power Systems, Cables, and new verticals like Railways, Telecom and Water. 90% of customers are Government firms. Beyond India, it has supplied power infrastructure to 45 countries globally. In addition, in Sept ‘10, KEC took over SAE Towers, a US based lattice transmission towers manufacturer, for $95m giving it a strong North & Latin American footprint. The acquisition / integration has been successful. Manufacturing plants are in India – Nagpur (Mah. ), Jabalpur (MP) and Jaipur (Rajasthan); Americas – Monterrey (Mexico), Belo Horizonte (Brazil). Total tower manufacturing capacity is 251,000 MTs. Employees number over 4200; Order Book is Rs.9,200 cr, giving about 2.2 years of visibility (@FY11). The core capability of KEC is its ability to deliver power transmission lines to Utilities, from design, to materials procurement, to execution, involving Project Management, Design & Engineering skills. Forward integration – into Power Systems, designing and constructing substations (range of 220 to 1150 kV substations) and Electrical Balance of Plant (E- BOP) delivery services. Tracks related – new track laying/ improve old tracks, electrification /power systems. KEC is successfully diversifying its business, thus de-risking the overall business portfolio. See Fig 2. Classification: Power Industry is broadly classified into Generation, Transmission and Distribution. The Indian power sector faces huge demand growth. But the government’s power capacity Plan v Achievement has been as low as 51.5% in the 10th Plan. (We are in 11th Plan now). The shortfall of peak power has been 8-12% in the last decade. Over 40% of Indian population still doesn’t have access to electricity. Many have access to poor quality power. The Public sector dominates the industry, owning 70-80% of current assets. However the government is opening up to the Private sector. In future, 50% of investments are expected to be from the Private sector. Power Generation has grabbed a lot of interest, but focus in India is now shifting to Transmission, as in 2-3 projects, even after generation and fuel linkages were in place, the Power Evacuation facilities were not ready and all stakeholders are suffering due to the delay. Key players in the Power Transmission EPC are Areva T&D, Kalpatru Power, Jyoti Structures, Alstom Projects, etc. It’s a crowded market, and competition includes infra diversifieds like L&T, GMR and Reliance. A quick analysis shows among the listed focused firms, KEC has a 10-15% mkt share. The Transmission industry bidding norms have changed recently to ‘Tarriff Based Competitive bidding’, where the Service Providers like KEC are responsible for Build, Own, Operate and Transfer of power lines. TSPs earn in the form of Transmission Charges payable by long-term customers. Diversification of KEC beyond the Transmission EPC sector is good, as diverse businesses follow different cyclical patterns. Businesses set up in the last 3 years account for 30% of Orders Booked. KEC has good presence beyond India, with 55% of current Orders Booked from other regions. In the present power cyclical down phase in India, KEC is focusing on business in other geographies. As the flagship RPG Group firm, KEC enjoys good management focus for its initiatives. Established in 1945 as Kamani Engineering Company, the firm has a rich past, and has again reinvented itself into a modern powerhouse. Ramesh Chandak, the MD & CEO is a CA and has lead KEC for the last 10 years. KEC has shown a fine growth pattern (Fig 3) with Sales growing 18% CAGR over the last 6 years. Net profit has grown very well at 24% CAGR. Share price however has been volatile, moving to an all time high (in 2008) and low (in 2009). EPS has been growing rapidly at 30% CAGR. Cash Flow however has been uneven. Current PE at 9.3 is lower than current Industry average of 17. The Price and PE chart – Fig 6 – indicates that current valuations are in the bottom quarter of 6-year historical charts. Definitely indicates undervalued status. This is in spite of the 90% surge from 20th Dec ’11 low of 32. Price and EPS graph, Fig 7, shows that EPS accelerated till ‘08, then has been in the 5.5 – 7 range for next 3 years. The EPS should see an upside breakout from this range in the next few quarters. My expectation is that EPS will grow in the sector drawn in this chart. Debt equity at 1.51 (FY11) is very comfortable for an infrastructure firm. Orders Booked to Billings, Fig 8, shows an improvement over the last two years. Return on Capital Employed, ROCE, has been in a 22-40% range for the last 6 years. Return On Net Worth, RoNW, also has been at 17-38% range. These are good numbers. Operating margins have been hovering around 10% for last 3-4 years. This year’s high competition and entry into new sectors pushed it to around 8%. We expect this to revert to 10+ levels from FY13. Cash and Cash equivalents are at 800 crores. Plus with a low DE ratio, KEC has access to a healthy war chest of internal cash plus debt with which they can look at new acquisitions. The consolidated financials and PE of KEC have been projected for the next 3 years. Domestic interest rates unpredictability. This will affect the growth projections. Hyper competition. Orders booked in the last 12-18 months in India have been at lower margins due to high competition. The projections assume an easing up of this in India. Indian Power sector challenges. The key current issues are (1) financial stress among Utilities, particularly State Electricity Boards that are facing Tariff inflexibility and Collection issues, (2) Power Plants facing issues with fuel linkages and a shortage of Coal & Natural Gas, and (3) project execution delays due to government clearances like environmental, land acquisition, etc. This has affected the investment climate in this sector. The projects under execution by KEC are also affected, and execution/commissioning may be delayed. Business uncertainty in MENA region – already a part of the order book is affected due to unrest. Unpredictable events like a European sovereign default, some new media issue/ bad publicity or any governmental charge sheet, etc. can occur that can mar equity performance for short periods. India has a surging growth in electricity demand, yet there is a 9-13% power deficit today. This will widen in the next few years. Globally the thumb rule is that every rupee invested in generation must match an equal investment in T&D; however, in India it has been 1:0.5. There is now a huge opportunity for T&D players. As a leading transmission EPC Company, KEC’s fortunes are linked to the regulatory environment and overall industrial climate of the Indian power sector. In a stable / improving environment, KEC should perform excellently based on the current manufacturing and execution capacities. In 6 years, share price (adjusted) has increased by 1% while the EPS growth is 30% (CAGR). Other metrics like Sales, Orders Booked, Debt, etc too are favorable. The share is definitely under-priced. Current price is low due to poor sentiment/ pessimism in the Indian markets around the Power sector. However KEC is well diversified across geographies as well as business segments. From the steep fall of 2011, the share has bottomed out and risen rapidly of late, and is now at the key 200 DMA levels. Price should rise above this key level, and stay above for a fair period of time. Near term positives include the weakening of the INR against the USD that should boost KEC revenues and profitability. It is an exporter of services, but most of its costs are in INR. In FY12 end, and next few quarters, a lot of pending Power transmission projects are to be bid out, and KEC will win a fair share of new business. March 2014 target of 245, giving a 300% appreciation. 1. Check back on this website www.jainmatrix.com for updates. 5. Be sure to add punit.jain@jainmatrix.com to your address book or safe sender list so our emails get to your inbox.